A City University London academic has given a presentation to South Korean government officials after being invited to appear at a conference in Seoul. 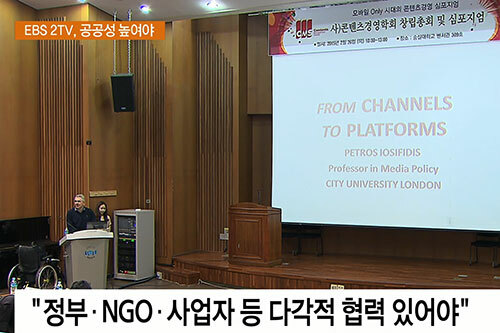 Dr Petros Iosifidis, Professor in Media and Communication Policy in the Department of Sociology, travelled to the East Asian country’s capital to deliver a speech about online media. His talk explored the use of the latest digital platforms by European broadcasters, as well as the challenges and opportunities brought about by recent advances in technology. The audience included academics and senior figures from the Ministry of Culture, Sport and Tourism and the Ministry of Science, ICT and Future Planning. Professor Iosifidis, who was interviewed by the South Korean educational channel EBS during his stay, said he was asked to discuss a wide range of topics with officials in the country. “I am grateful to Dr Chang Yong Son, a former PhD student of mine and currently Deputy Director of the Ministry of Science, ICT and Future Planning who sent me a personal invitation to give a keynote speech to the conference,” he said. “Discussions I held over lunch with representatives from the ministries, executives, broadcasters, journalists and academics alike focused on how to make public service content available on different platforms – not only broadcast, but also cable, satellite, online, mobile, broadband – and how that content could be accessed by consumer-citizens. Professor Iosifidis added that he believed the trip could help to strengthen ties between City and authorities in the country. “Given my short stay, it was suggested a closer collaboration could be established between City University London and the relevant Korean ministries to discuss further these issues and exchange national experiences. The academic gave interviews to three TV broadcasters during his visit and explained he was impressed with their willingness to learn about the tradition of public service broadcasting in Europe, especially in the UK. He said: “Most of the questions during the interviews focused on successful western models of funding public service content and potential transfer of such models to the South Korean media and communications market."